Wouldn’t you cherish the opportunity to sit at a dinner table with Ruth Reichl, Dorie Greenspan, Susan Orlean, and Amanda Hesser? 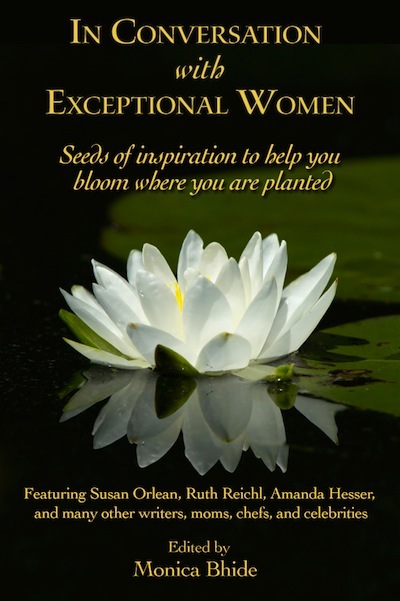 You can (sort of) when you read Monica Bhide’s ebook, In Conversation with Exceptional Women: Seeds of Inspiration to Help You Bloom Where You Are Planted. 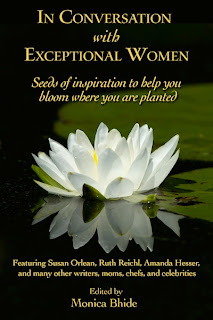 Bhide, also exceptional, -- she’s an engineer-turned-renown cookbook author, writer, and mom of two -- interviewed 55 accomplished, inspirational women and compiled their insights in this notable ebook. After posting several interviews on her blog, A Life of Spice, Bhide thought an ebook was the natural next step. So she reached out to women, who to varying degrees, had an impact on her life, including Top Chef host, Padma Lakshmi, award-winning author, Deborah Madison, and food blogging pioneer, Elise Bauer. You'll learn about their work patterns, their muses, their failings, and their successes. Some interviews are humorous, others poignant, all inspirational. You could read this book at one sitting, on a lazy Sunday, but I wouldn’t recommend it. Take it one story at a time, perhaps with your morning coffee or afternoon tea. Savor the honesty, drink the wisdom. And remember, you’re exceptional.